The latest in our series of dynamic live programming Slone Partners produces in major U.S. healthcare hubs addressed the state of scientific healthcare investing, and the coming-of-age of artificial intelligence, machine learning, and Big Data in biopharma Dx, and tools. 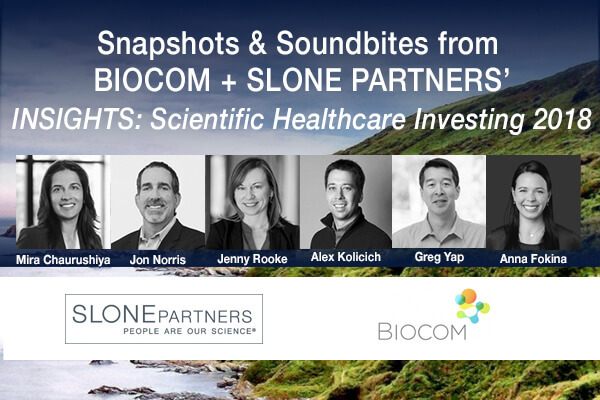 We proudly partnered with Biocom San Francisco on October 25, 2018 for Insights: Scientific Healthcare Investing 2018, a lively panel discussion that produced a wealth of insights into what’s driving banking and venture capital decision-making in a scientific healthcare environment which increasingly relies upon advanced technology. Over 110 scientific healthcare executives and industry watchers were in attendance for an evening of discussion and networking. The scientific healthcare industry is experiencing unprecedented advances, propelled by technology, artificial intelligence (AI), machine learning (ML), and data mining. Life sciences and diagnostics companies, bolstered by robust venture capital and M&A activity, continue innovating with patient-centric personalized medicine approaches, wearable technology and at-home services. These environments and convergences, coupled with a robust biopharma drug discovery pipeline, create an exciting healthcare marketplace to which Slone Partners places world-class executives. Question: Where is Artificial Intelligence in Biopharma, Dx and Tools? Where is AI in reality vs. the buzz? AI works well as a component in drug discovery, but don’t just do AI for AI’s sake. It’s one tool, but it’s not the only tool. AI is real in its ability to grapple with ever-increasing amounts of data. AI helps us get there smarter. Reality is investing in the first AI diagnostic. For instance, computer vision application in diagnostic products is real. AI application in drug discovery is more successful at the top of the funnel for identifying drug candidates versus the bottom of the funnel. Recursion Pharmaceuticals brought AI to drug discovery – AI is the core of what they do. It should be used side by side with biology, versus being a panacea. Question: Where in the value chain do you invest in drug discovery and tools, or clinical trial and patient engagement? What AI business models do you think are the most interesting? The opportunities are in drug development and discovery. If AI can help select patients that will have a positive outcome from a drug, that’s a good application. The value capture in therapeutics is great, while the platform companies are powering the wave. But the question is … can you sell the picks and shovels once the wave starts? Platform companies can be more attractive than single asset companies who are trying to find ways to use pre-clinical data to predict clinical outcomes. This is the intersection of the worlds of science and technology. The platform companies partner with large pharma to help them develop their own therapeutics. Others focus on their own drug and sell the platform to other pharma companies. Question: What about big data? On one end you have very powerful sequencing technologies and on the other end you have monitoring vehicles like Apple Watch. How good are we at sorting and analyzing data, and how do you validate results with investors, partners and acquirers that it’s validated? Companies must be careful not to start out with data sets that are too diverse or it will become too difficult to assess what data failed. Controlling the data and its structure. In genomics, data has good structure, which is the most important thing. The questions are how much data is there, what data is missing, and what data failed? Question: There is a perspective that Artificial Intelligence and Machine Learning is only as good as the training you put into it. How do you train your algorithm to evaluate what you want to evaluate? What are the questions you ask companies as to how they do it? One investor wants to have the first drug generated by AI. How do we evaluate what is in the black box? How do I know that the molecule I get out of the black box is better? We want to see a test data set that tells us something we wouldn’t have otherwise known. Investors want to see repeatable independent data sets. Look at the challenges of integrating and normalizing data – whether it came from an AI algorithm or a screen. Can the company being evaluated explain the experimental data in a way others can understand? Have they done the basics of design of data? We need to understand experimental design where the test set must be independent of the training set. How the data is structured. Does it make sense from a scientific standpoint? Is it chemistry based or biology based? How is the data being built? Investors spend a lot of time here. Question: We see a stratification between tech expert investors and healthcare expert investors in this space. Oftentimes, syndicates are heavy on only one group or another. Any recent experiences bridging the gaps? There is not a lack of willingness of the two investor groups to work together. One success story is Pear Therapeutics. There are two syndicate groups that are willing to trust each other. Investors hope to see more of that in the future. It’s hard to get those two camps to talk, but multi-disciplinary syndicates work best. Both types of investor groups see things differently, the differences being the types of platforms each one looks for and their valuation strategies. A major difference is timing. It can take a life science investor months to evaluate a deal, but with a tech investor, it’s much faster. There is definitely a difference in urgency between the two groups. Entrepreneurs need to understand how each investor group wants to hear the story and make their pitch accordingly. Some entrepreneurs have two pitch decks: one for tech investors and one for healthcare investors. Investors would like to see more cross-investments, working with entrepreneurs that have a diverse portfolio of products. Question: There are a lot of Series B companies in the AI/ML and Tools/Dx space that are valued north of $100M with nascent or no revenue. What are the end game opportunities for investors? IPO? M&A? If M&A, do we think a new group of acquirers will emerge as historically, venture-backed M&A in this space is only around $150-200M? There’s a disconnect around expectations of exit. Tools companies have fewer customers and diagnostics companies have more uncapped upside. Exits could be Partnerships, M&A or IPO’s. A lot of companies exit at Series B offerings.